Rewilding Europe is delighted to welcome a new member from Germany to the European Rewilding Network. Displaying impressive growth since its launch at WILD10 in Salamanca in October 2013, the network now comprises 61 members from 26 European countries (including Rewilding Europe’s eight operational areas). The European Rewilding Network is thrilled to welcome the Auerrind project, a new member from Germany involved in the researching and back-breeding of aurochs. The Auerrind project, the newest ERN member, is a rewilding project focusing on natural grazing, back-breeding and scientific research on aurochs (an extinct species of large wild cattle). 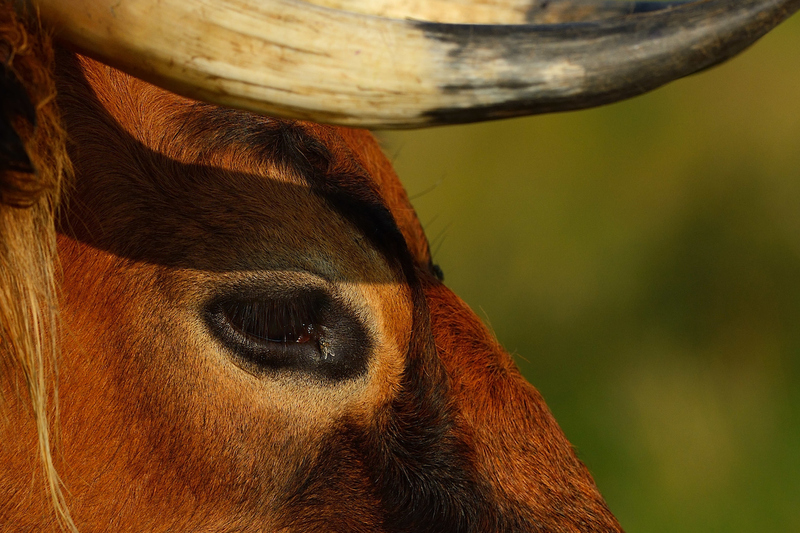 The ultimate goal of the back-breeding part of the project is to create a modern-day aurochs equivalent as closely as possible, from both a genetic and phenotypic perspective. 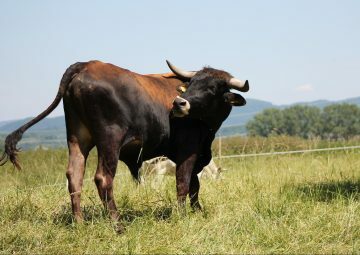 A breeding bull of the Auerrind project. Based at the Lauresham Laboratory for Experimental Archeology in the Bergstraße district of southwest Germany, as well as the nearby Association for the Reintroduction of Large Herbivores, UNESCO Global Geopark Bergstraße-Odenwald and Hohmeyer landscape conservation farm, the Auerrind project also works to raising awareness about the need for large herbivores in European nature. Since it began in 2013 the Auerrind project has established four breeding herds in Lorsch, Einhausen, Bielefeld and Schwarzach, with bovine grazing on more than 50 hectares of land. An extensive system of meadows is currently being developed that will allow year-round grazing, with plans to introduce a herd to a fifth location in Groß-Rohrheim in 2018. The animals currently involved in the project are roaming and grazing on river meadow habitat, which includes old sand dunes covered in pine forest. 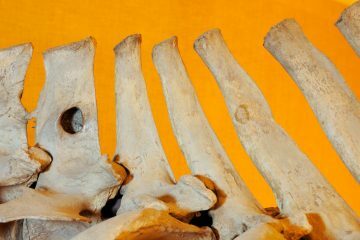 In addition to the four breeding herds, the Auerrind project has also established an auroch research database which includes data from the radiocarbon dating of bone material from the Upper Rhine Valley, and the DNA testing of auroch remains developed in cooperation with the University of Kiel. 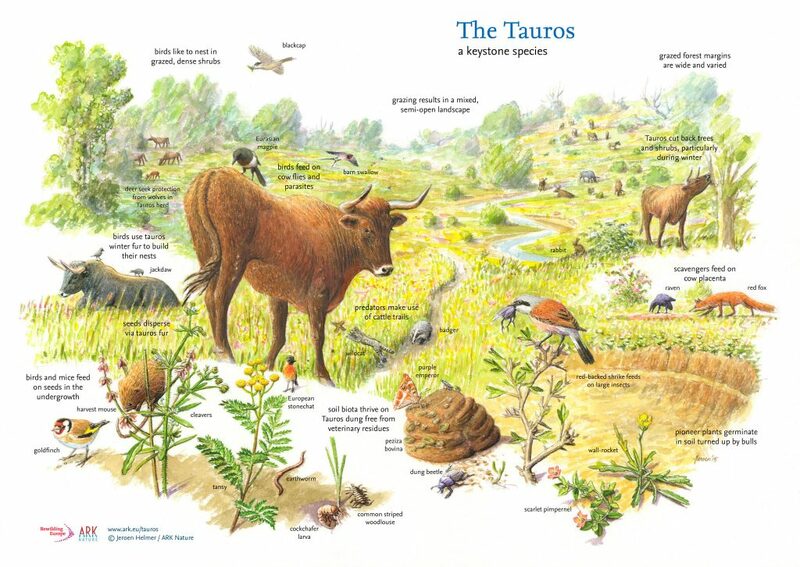 In April 2018 the Auerrind project signed a cooperation agreement with the Taurus Foundation from the Netherlands, with the ultimate goal of replicating the auroch as closely as possible. The first step in the new collaboration is to bring a breeding group of cattle from the Taurus programme to Germany by the summer of 2018, and to provide new offspring with suitable breeding sites created by the Auerrind project. In cooperation with the Taurus Foundation and the Tauros Programme, the Auerrind project aims to share research results in the field of auroch morphology, ancient DNA (aDNA) and DNA analysis, in accordance with the research partners of the Tauros Programme, such as Wageningen University. The Auerrind project, in cooperation with the Taurus Foundation, the Tauros Programme and other partners, will share research findings on the genetics and morphology of aurochs. The Auerrind project and Tauros Programme have also agreed to work together on the exchange of suitable animals for selective breeding and for use in selected rewilding areas. The two parties will jointly work to conserve the foundation stocks of each breed, thereby ensuring the exchange of animals to preserve genetic diversity going forwards. The views of Auerrind project leader Claus Kropp reinforce the importance of the ERN as a platform for international exchange. Currently the Auerrind project has five breeds planned for the breeding project. These are: Chianina (an Italian breed of cattle), Sayaguesa (an endangered Spanish breed of domestic cattle), Maremmana (a breed from Tuscany), Hungarian Grey (an ancient breed indigenous to Hungary) and Watusi (also known as the Egyptian or Hamitic Longhorn). Rising levels of land abandonment in Europe mean large areas are becoming overgrown with shrubs and trees, leading to a decline in biodiversity. Rewilding Europe and its partners are working together to tackle this problem by reintroducing wild herbivores. As part of their efforts to share expertise, experience and data with nature conservation projects, Auerrind recently hosted and organised a conference on natural grazing and back-breeding. The project is also involved in education and nature-based tourism, offering various activities such as bike and guided tours, and educationally themed exhibitions and conferences. Rewilding Europe is part of a burgeoning pan-European rewilding movement which has seen many impressive and inspiring initiatives develop over recent years. With rewilding-related projects continuing to multiply and flourish across the continent, the objective of the European Rewilding Network (ERN) is to connect, support and strengthen them. Rewilding Europe extends a warm welcome to all rewilding initiatives and encourages them to apply for membership of the ERN. Please view this page for more information on application.